2. Chleb ski with two ski centres: Chleb and Oštiepková mulda ski resorts. 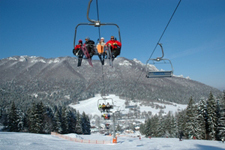 Paseky ski resort belongs to TOP ski resort in Slovakia offering 4-seat cable car and 3 ski lifts. There are ski school and snowboard school, ski and ski equipment rental and ski service, ski bar, multifunctional building with a restaurant, snack bars and souvenir shops. The ski trails in Pasenky ski resort are more than 3 km long and use artificial snow. They are suitable for medium difficult and difficult skiing. Alpine skiing and snowboarding race are held annually in the PASEKY ski resort. Ski trails are situated at the altitude of 678 to 1000 meters above sea level. Paseky ski resort is suitable for winter holiday. The ski resort offers free parking. Kids Zone offers good conditions for beginners and children offering children’s’ playground with ski school, snowboard school with SunKid conveyor, snow tubing and sledging. The ski resort offers Professional babysitting for your children located near the Kids Zone. Poludňový Grúň ski resort can be reached by 4-seat lift from Paseky ski resort, and train connection. Poludňový Grúň ski resort is covered by natural snow and the ski slopes are located at the altitude of 1,000 to 1,260 meters. Chleb ski resort is oriented to the north. Difficult ski slope with elevation of 750 m is accessible by a modern 8-seater cable car reaching up to Mala Fatra hill at the altitude of 1500 meters. Due to its winter conditions the ski resort is suitable for spring skiing even in May. Oštiepková Mulda ski resort is located only 100 meters from the pinpoint station KLD Chleb. It is a difficult ski slope also north oriented and offers perfect conditions for challenging skiing and snowboarding. 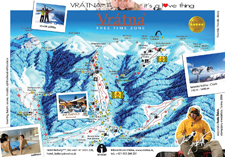 Panoráma restaurant and sunny terrace with deckchairs, regularly kept slope of 3100 meter of quality skiing and snowboarding makes Vrátna Free Time Zone a popular ski resort in Slovakia.